Where's the next water? The water stations weren't marked on the map we'd been given, though I was sure that in previous years there was at least one water station, perhaps near the Marina. Where's the nearest loo? Sorry to the runner who asked this, I remembered later that are re some at the children's playground opposite. We did our best to encourage the runners as they passed. I suppose I must look the same when I run, but it was striking how few look happy by that stage. Next year, I hope to be back running the event. I spent last week, half-term, on drugs and, on the doctor's instructions, was not allowed to do anything too strenuous, so I restricted myself to regular, but mostly short runs around Seaford. The figures below are for Saturday and Sunday runs, and I also managed a 1000 yard swim on Saturday morning. On a sunny day with the scent of spring in the air, I ran along a crowded seafront in the afternoon, dodging dogs, toddlers, prams and wheelchairs, a suitable complement to a 1000 yard swim in the morning. I have followed the doctor's advice so have kept to an easy pace, with one exception. Nevertheless, I have managed to run or swim every day this half term, making the most of my time off. On Tuesday I ran for five miles along the front. It was warm, so though I started with a fleece on, I quickly took it off. I ran as the diggers and shingle-moving lorries were at their work. Last night I ran for the first time with the Seaford Striders. There were apparently fewer runners than usual, as many members had gone to the Sussex Grand Prix prize-giving, the Striders having won the Overall Club and the Ladies Open Team, and Geoff Gray and Natasha Swan the Mens and Ladies Senior League titles. I ran with a group who were perhaps a little fast for me but don't tell the doctor. 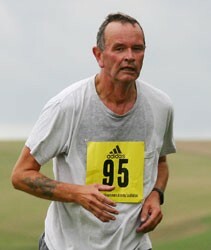 I felt fine afterwards, and came home with a Striders vest for Eastbourne and Hastings. As for swimming, I went on Monday and today to the small, 25-yard Seaford Head pool, and managed 750 yards on the first day and 1000 on the second, quite respectable, if not fast. I illustrate this with a photograph from the 1908s, when I would swim in the Cam at the University bathing sheds. In those days the Cam was still polluted, and this may be the reason for the large amounts of duckweed. Today I should have run fifteen miles; instead I ran three. And those are the only three I have run this week. My asthma has been bad, so I went to the doctor, who prescribed a ten day course of prednisolone, with instructions to run gently. So I cancelled today's long run, and I've pulled out of next week's Sussex Beacon Half Marathon, though I've volunteered to marshall instead. I may be able to substitute the Eastbourne Half for the Brighton event, and when I think about it, my training for London covers sixteen weeks, that is 112 days, so I can manage ten days of easy running. As it's half tem and I'm at home, I'm going to alternate running days with swimming days, and maybe go along with the Seaford Striders on Wednesday night. The three miles I did today took me along Chyngton Road, up Seaford Head and back along the cliffs. I felt a little weird afterwards, and my legs were tired. Today's long run, the end of a more successful week of training than some, took me to Firle Beacon again, up Beddingham Hill, the ridge above Norton and Bishopstone and back along the sea front. There was a light wind, sun and much mud, particularly in the second half of the route, which crosses some fields. On the north side of the top of the ridge there were still small patches of snow. My workplace being closed yesterday, I ran at about 4 pm, for no training reason, just because I enjoy running in snow. In general it was easy enough: the pavements were mostly clear, and the top of Seaford Head snow-covered, but not difficult. The descent of Seaford Head, near the toboggan runs, was very tricky however, though I stayed upright. I ran thirteen miles on Sunday, the first run of the month. I enjoy the way the months break up the training schedule. January is behind me, February is short, then there's March and finally April, the month of the marathon itself. It was cold but I chose to wear shorts rather than my long trousers which chafe. I went out to Bo Peep, up and over Firle Beacon to Firle Bostal and back by way of Blackcap Farm, Norton and Bishopstone. On the more exposed sections the wind cut like a knife, and a few flakes of snow passed my vision. I could see how, if a lot of snow had come, I could easily have got into trouble. It was not as muddy as last Sunday: in some places the ground was frozen. My breathing was better, my pace improved and my legs held up well, though I must confess to walking a couple of inclines towards the end. Had I gone the longer Beddingham hill route, that takes the runner back along the ridge above Bishopstone, and then along the sea front, I dare say it would have made for fifteen miles. I went to collect my number for the Sussex Beacon half-marathon in the afternoon, but found them packing up when I arrived. No matter, it will come in the post.